The Catholic Church in the U.S. is celebrating National Vocation Awareness Week, November 4 - 10, 2018. This annual event is a special time to reflect on the beauty of this special gift that each vocation is to the Church and the whole world, whether it is a vocation to the priesthood, diaconate or consecrated life. 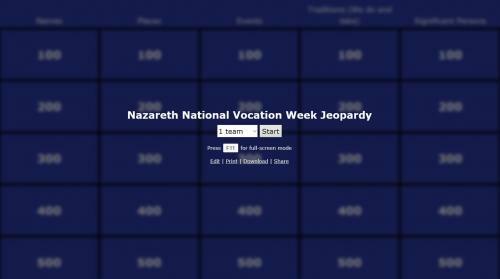 To celebrate National Vocation Awareness Week, we thought it might be fun for you to test your Nazareth knowledge and get to know us a little better. Below is a Jeopardy-style game you can play to test what you know about our history and our spirituality (and maybe learn a few things along the way). As Sisters of the Holy Family of Nazareth, we are blessed with so much of God’s love in our daily life. Let us ask Emmanuel, the God-with-us, to send others to continue the labor of love in his vineyard. Please pray with us for all those who have answered the call to religious life and for all those discerning God’s call for their lives. To see if your path is leading you to God through religious life, read more on our Become A Sister page or contact Sr. Emmanuela Le at vocations@nazarethcsfn.org. We also invite you to pray the Prayer for my vocation.